I love exploring parks and recreation areas and I’m always on the hunt for new places to exercise. In a big city like New York, you never know when you’re going to run into an opportunity for a workout! That’s exactly what happened to me during a recent visit to Coney Island. A standard trip to the beach turned into an impromptu training session when I discovered there were pull-up bars and a “Parcourse FitCenter” down there. (That’s really what the sign says!). 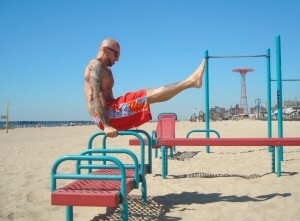 There is enough equipment on the beach at Coney Island for anyone to have a great workout. 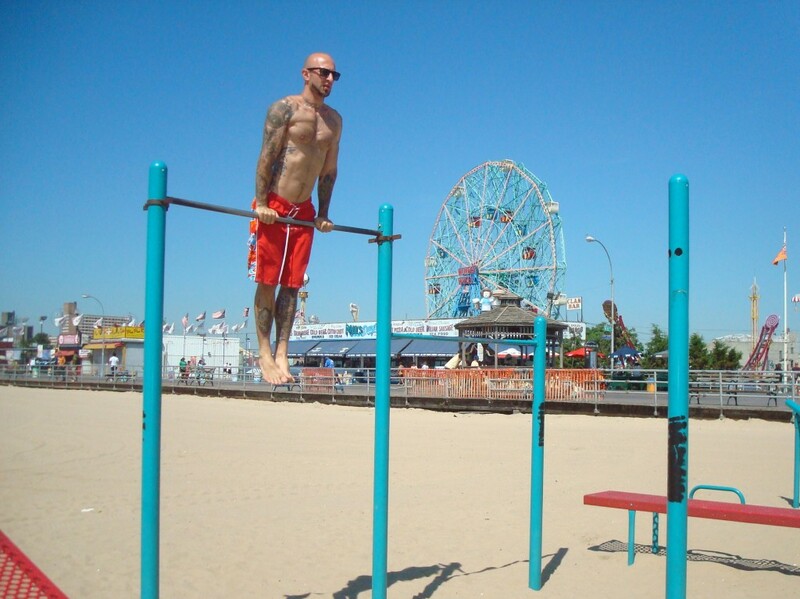 There are pull-up bars, parallel bars and other equipment in the sand, and it’s all free for anybody to use. 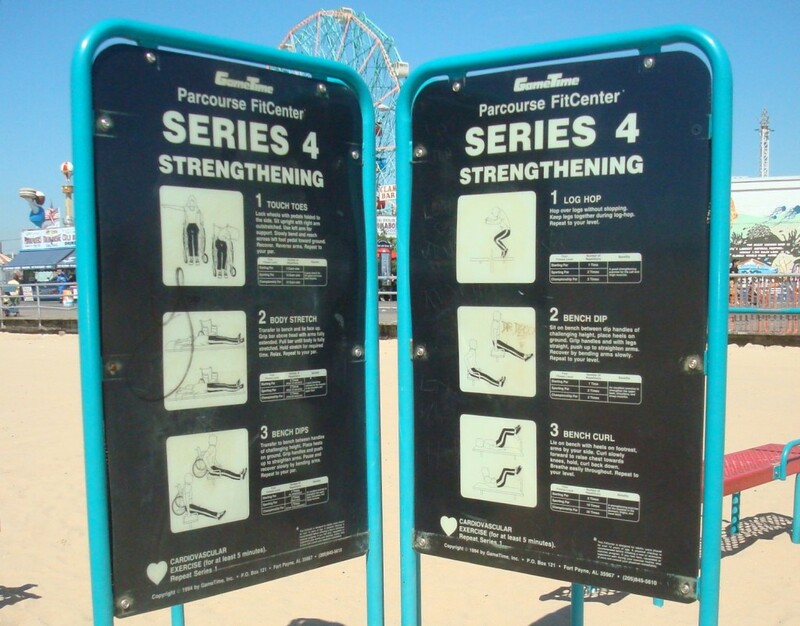 If you take the Q or F train to the W. 8th street stop, you’ll see the fitness area is right on the beach outside the train station. 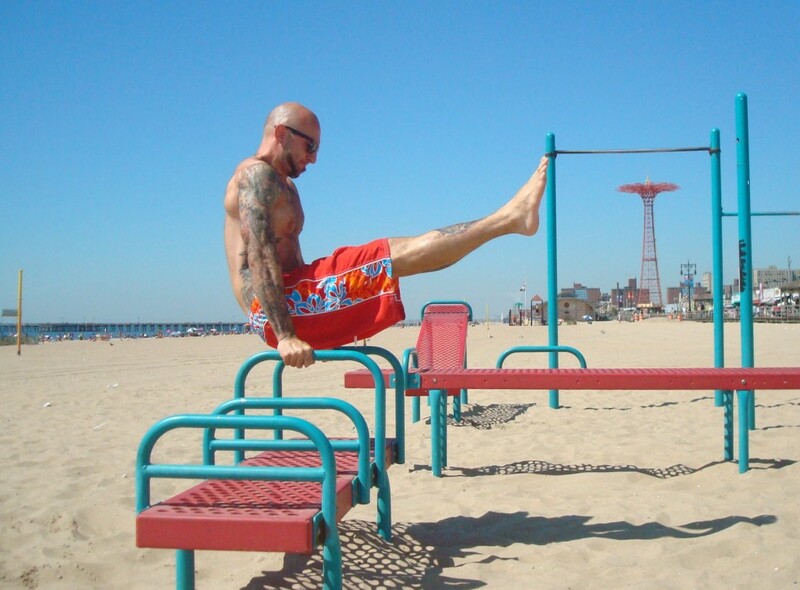 A company called gametime manufactured the fitness center at Coney Island. 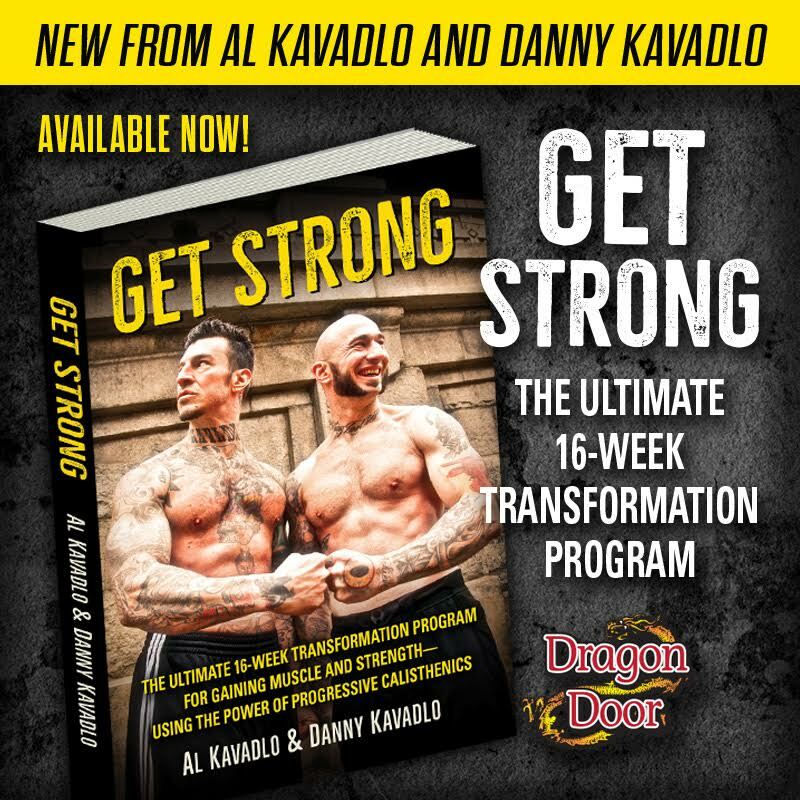 With more and more of these types of facilities popping up around the globe, it’s impossible to deny the popularity of bodyweight strength training. 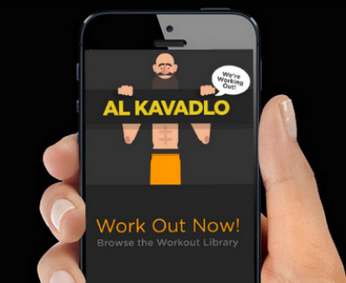 Keep an eye out around your neighborhood for good places to work out. If you can’t find any, contact your local government officials to let them know that your community needs free places where residents can exercise. Brilliant! This stuff should be everywhere. Nice. Wish we had stuff like that around here. We was out there in the afternon yesterday. when was that?? Hey Rick – these pictures were taken about a week ago. There's usually a bit of a lag between when I take pictures/video and actually get the content up on this blog. I like that we're on the same page though – guess we've got that cosmic intuition going! a pair of post hole diggers, great shoulder workout, some pipe and wood 4×4 post and bag concrete mix my pull up bar and dip bars have gone up for less than $200. a lot less than this store bought. Building your own equipment is a great way to save money and get a good workout! I'd love to see some pics/video of your set-up! 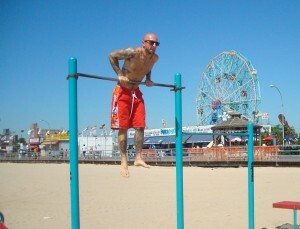 Unfortunately, most people in NYC don't have enough space to have a pull-up bar or dip station at home. 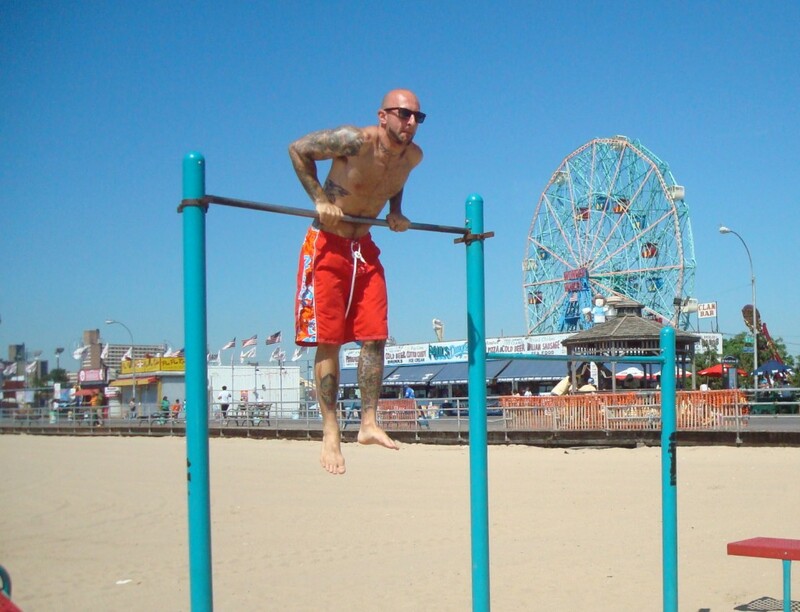 Big cities need public facilities where people can get in some reps. It sure is. The sand was really hot though!